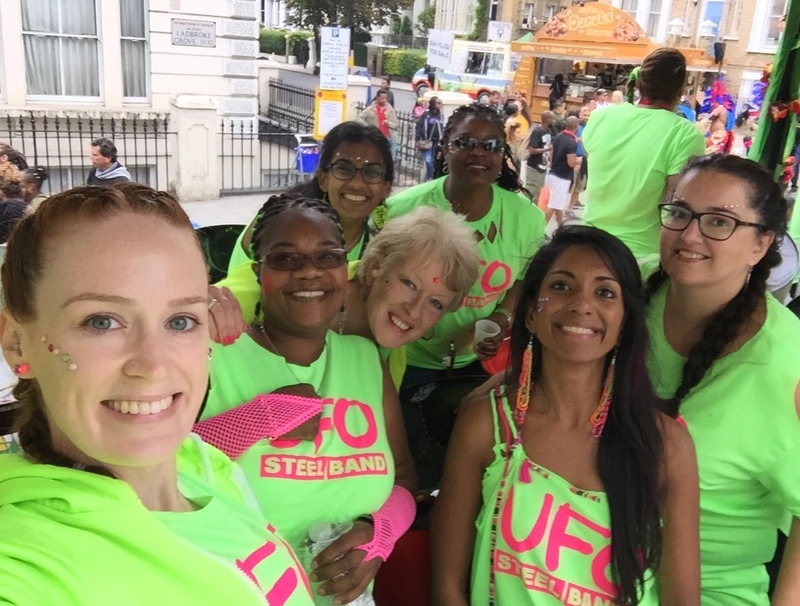 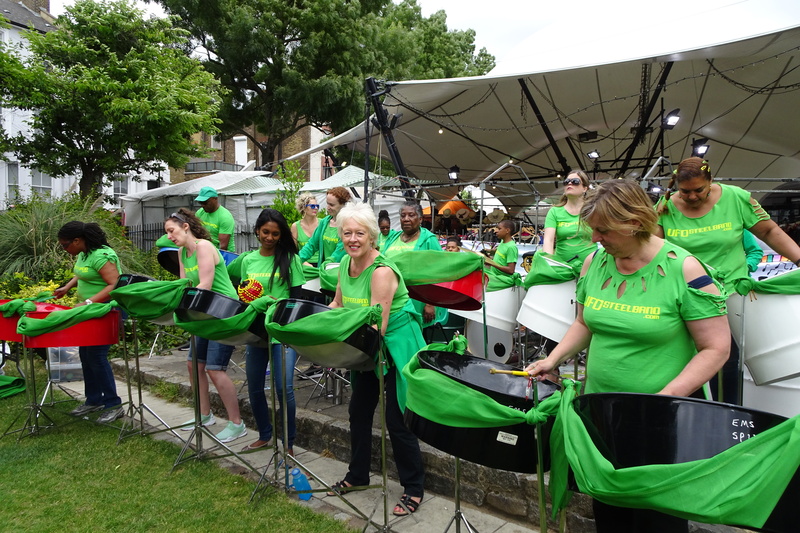 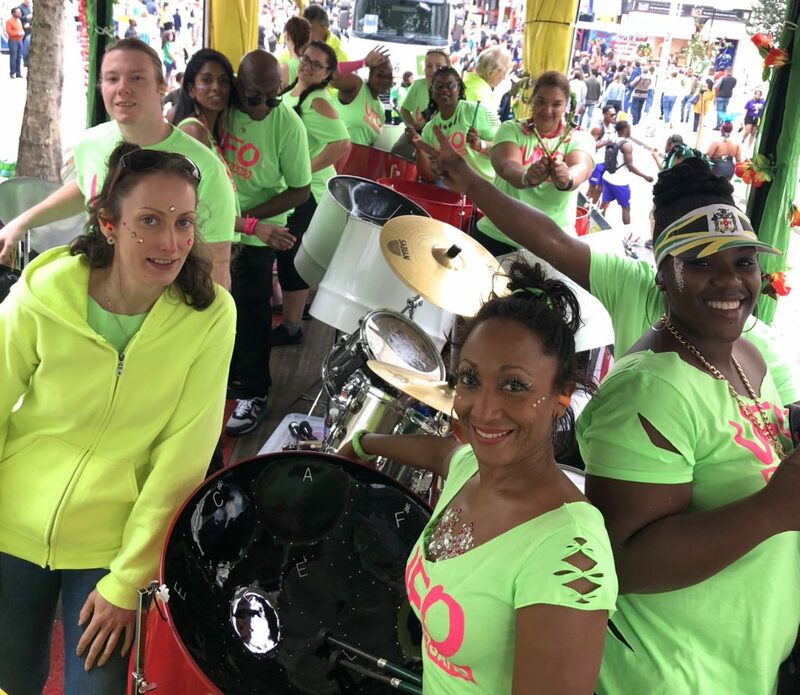 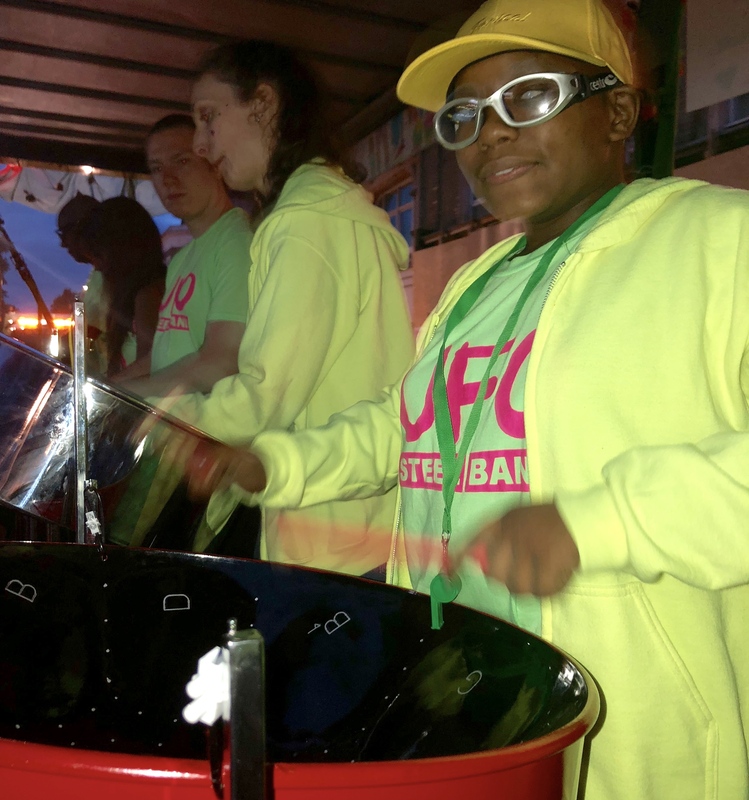 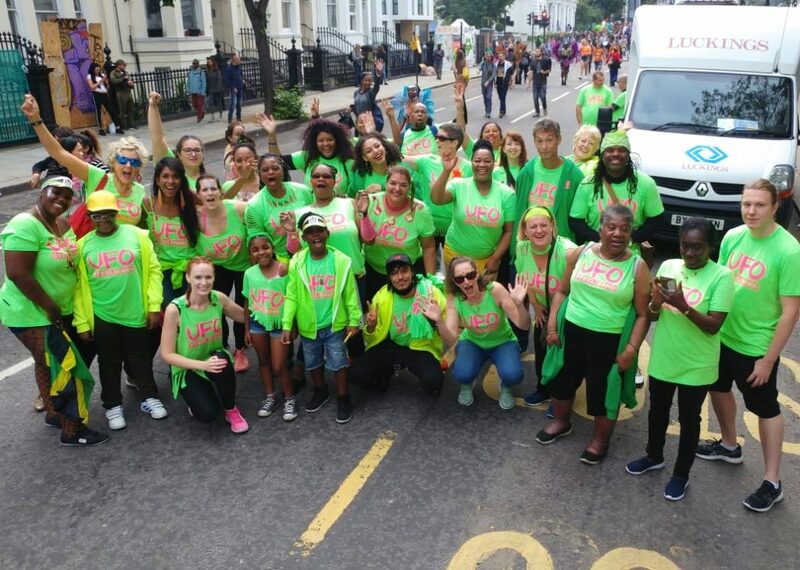 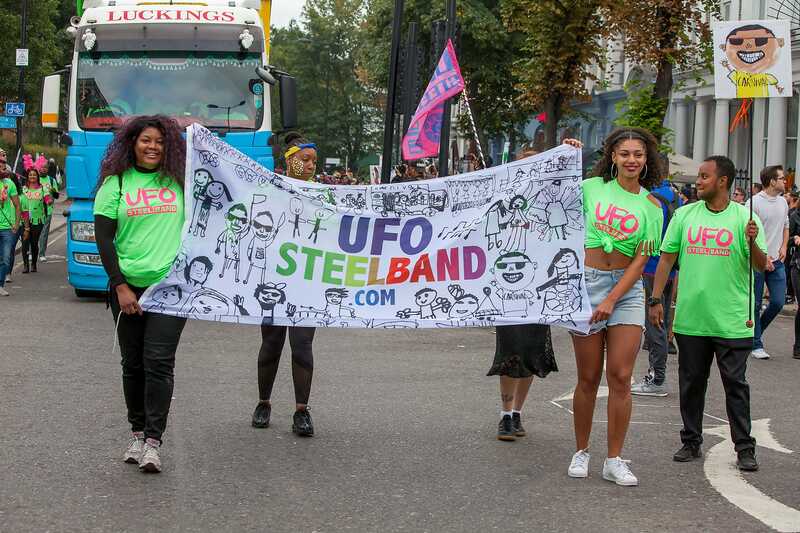 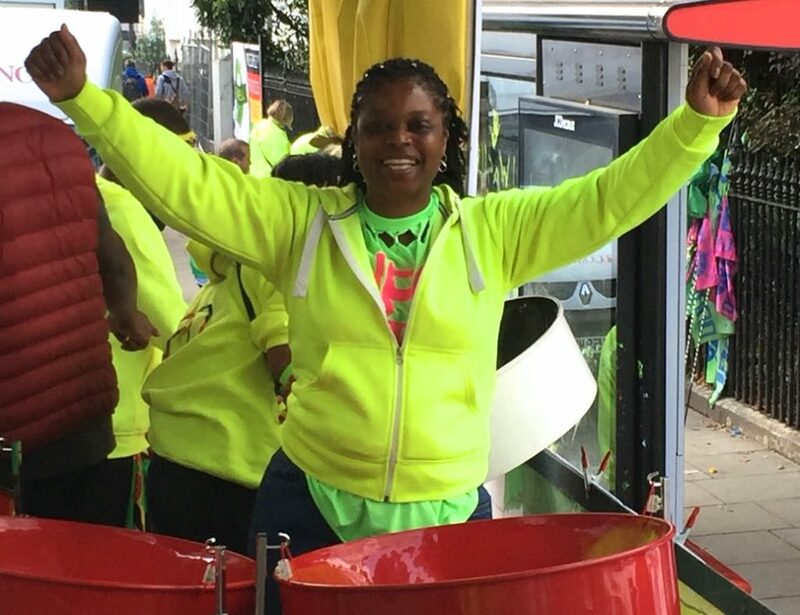 This blog is bout UFO Steelband taking our summer project to Notting Hill Carnival 2018. 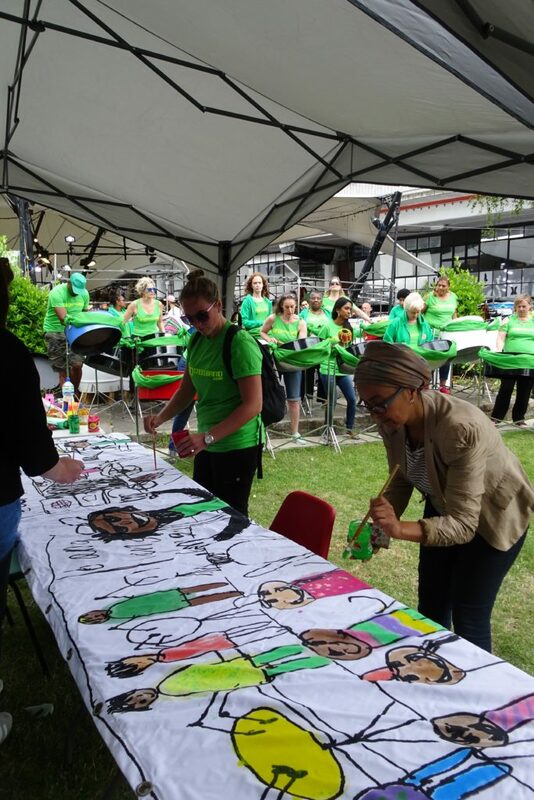 The photos below show how – one year on – we took the banners back into the community to add colour. 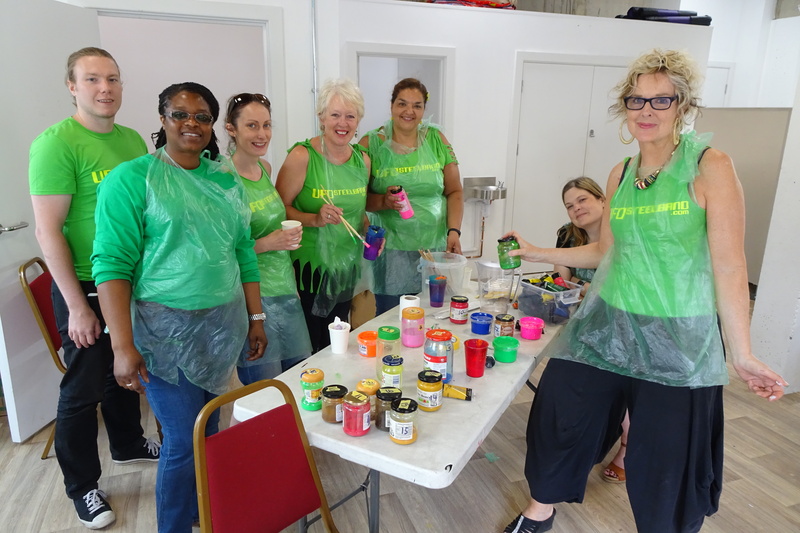 Thanks to donations of paints from Windsor and Newton , the project worked wonderfully – and the results exceeded expectations. 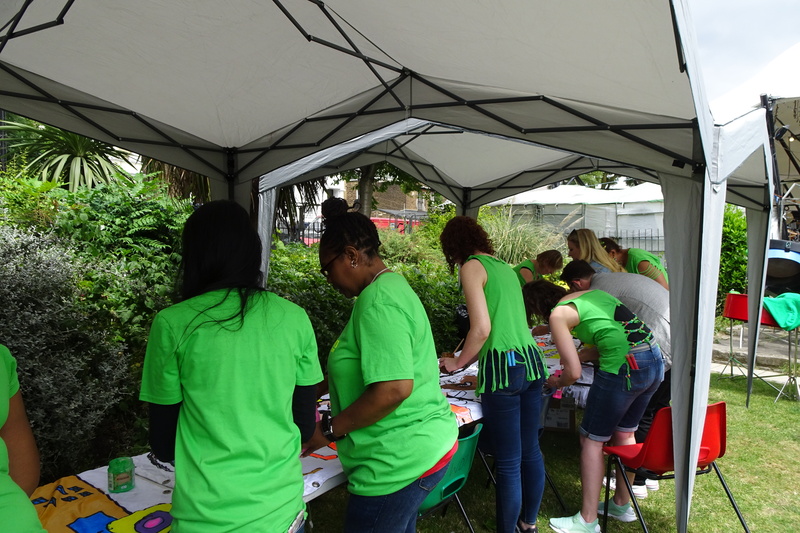 The photos start with our MiniFestival on Portobello Green and at The Curve – where our volunteers – wearing green t-shirts – first worked out methodology and demonstrated techniques before the workshop started. 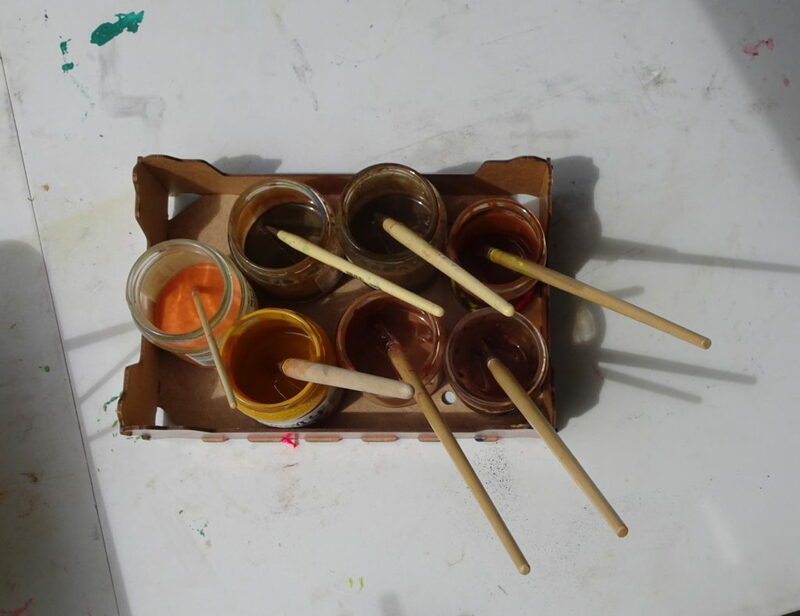 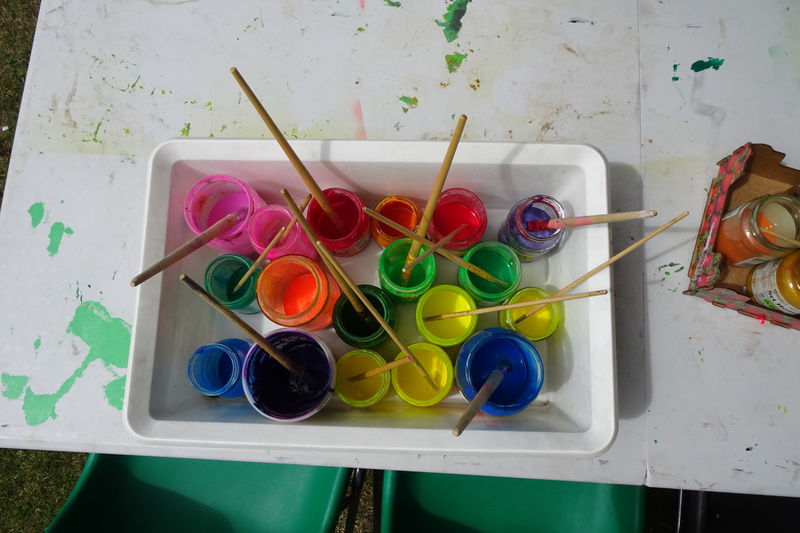 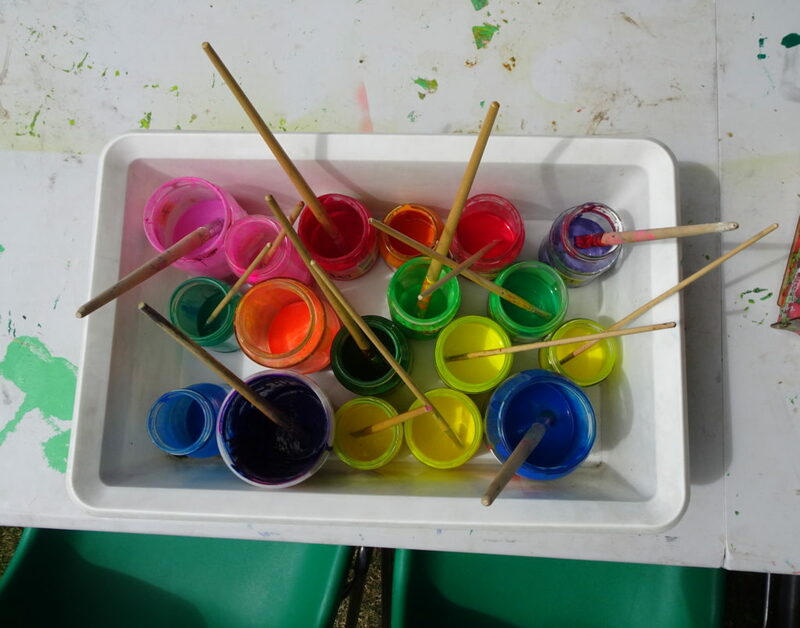 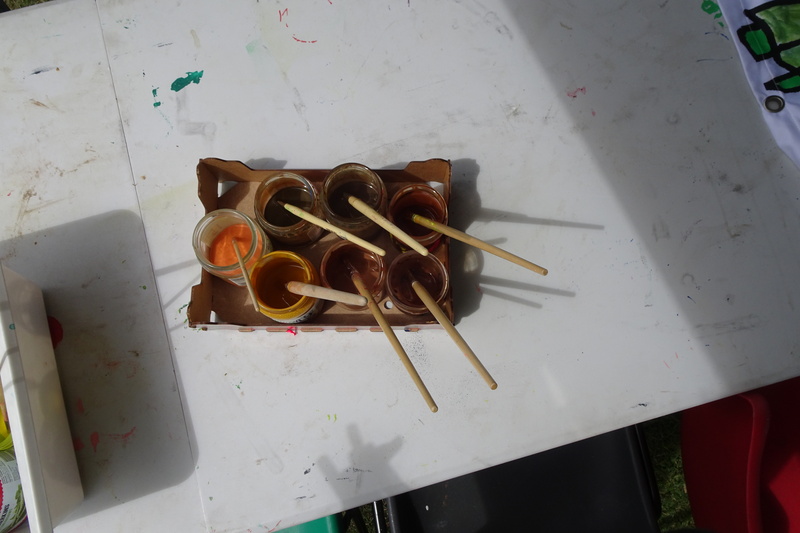 We worked out that the paint was best watered down and mixed by shaking in sealed jam jars… and we made sure the palette of colours remained clean and vibrant by constantly washing the brushes for the young participants while they worked. 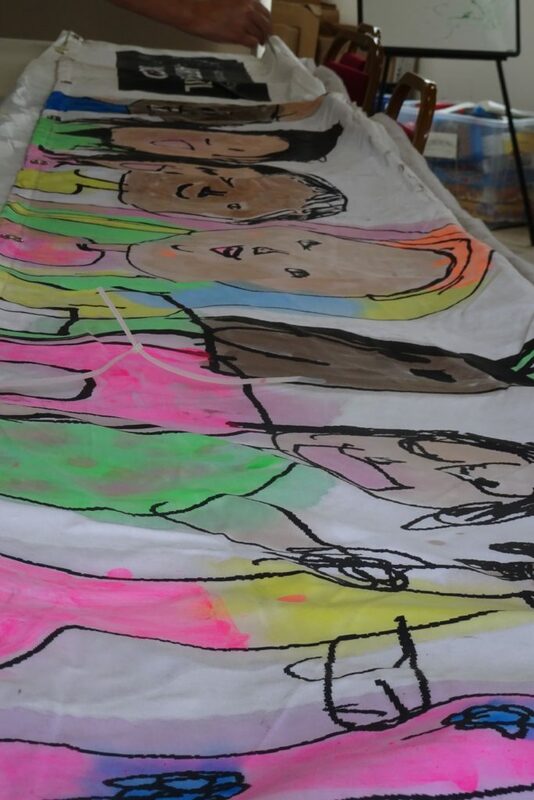 We took great care to make sure that, reflecting our community, we had a range of skin tones in the paints, and while working with children described these all as “flesh coloured paint” so we were challenging the inaccurate labelling and conditioning around what ‘flesh tone’ actually is. 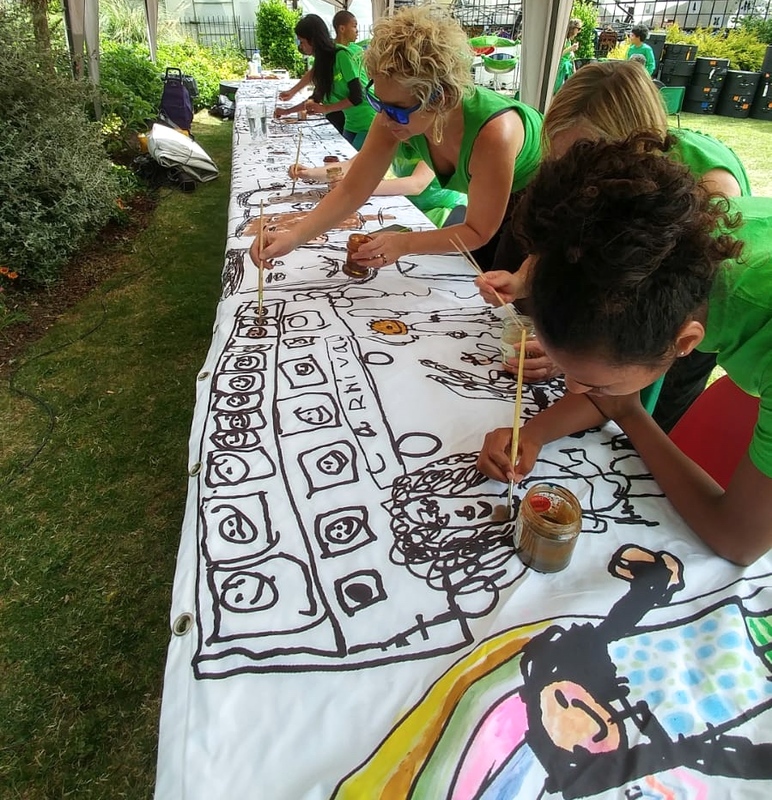 We found that the acrylic took well to the canvas and dried quickly in the sun, so we could roll the 12 meter banners and release more ‘clean’ canvas as we worked. 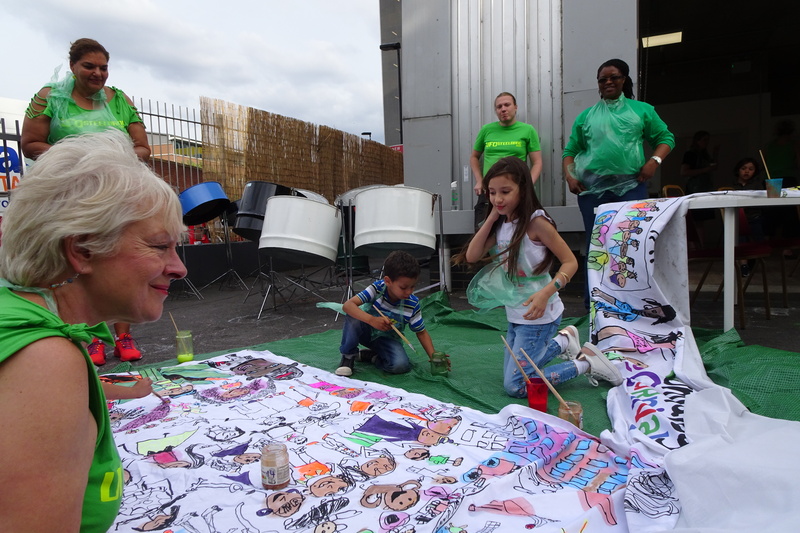 When ready, we were joined by the participants who were children, young people and adults from the local community, as well as people who happened upon the events when visiting West London. 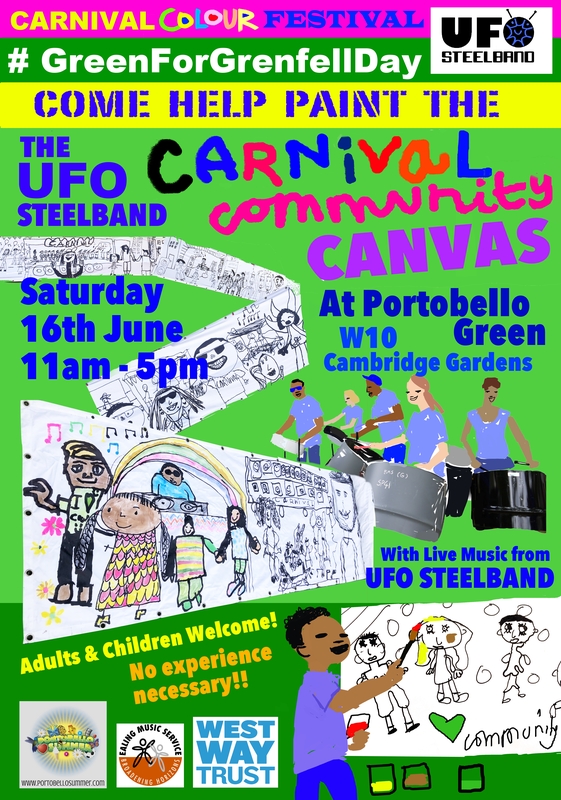 UFO played steelband performances while the public painted, the music bringing the whole event together – and on each day we were so lucky to have beautiful sunny weather. 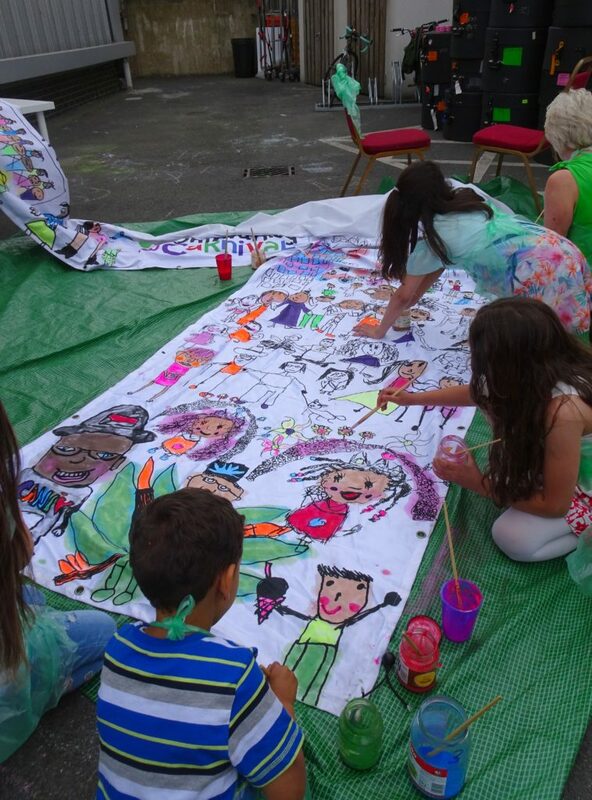 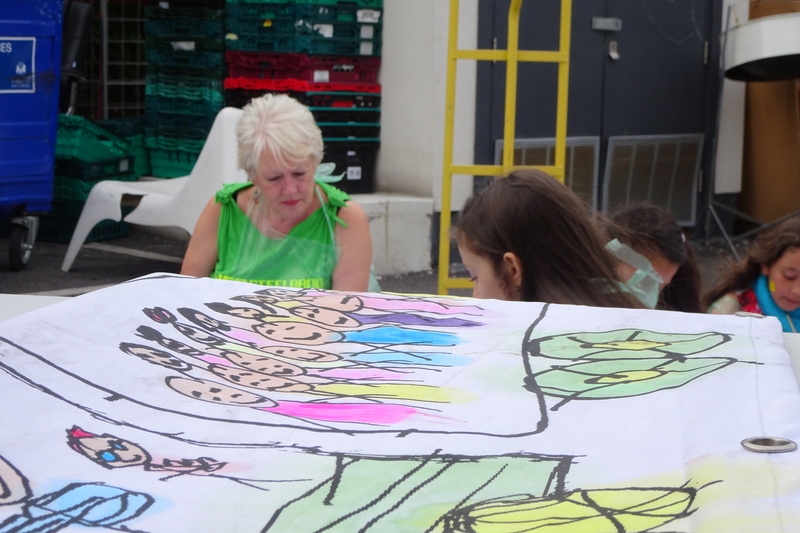 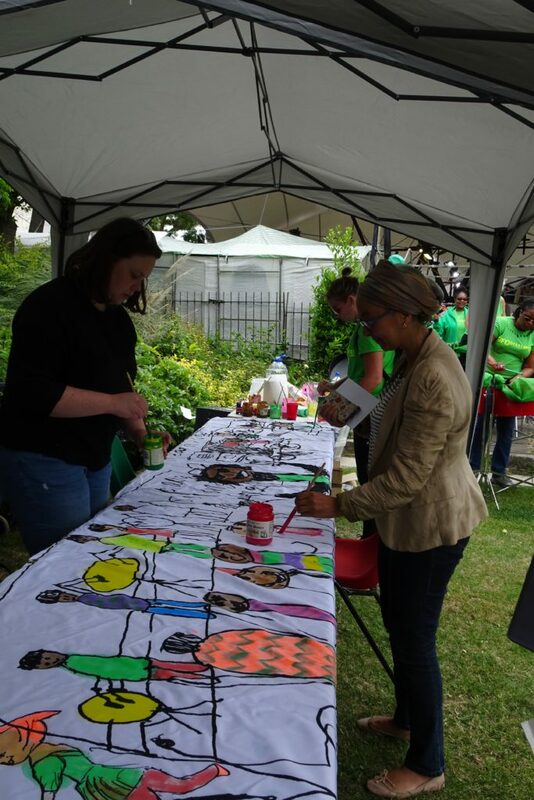 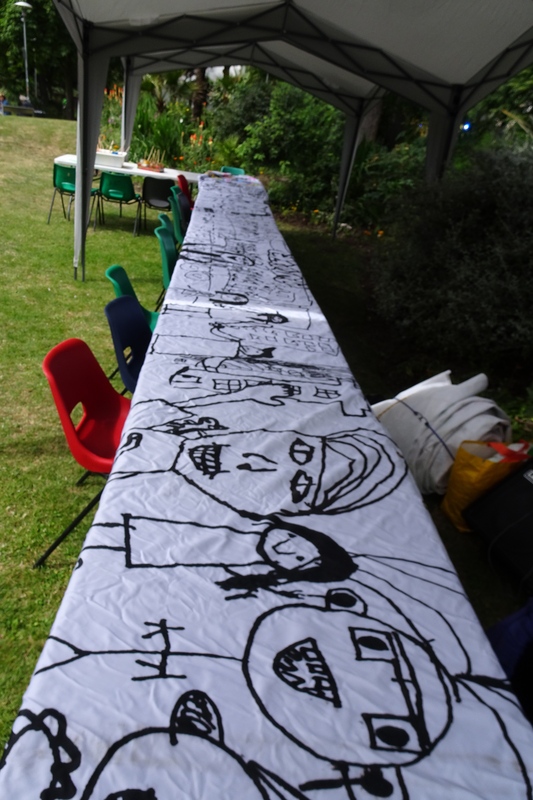 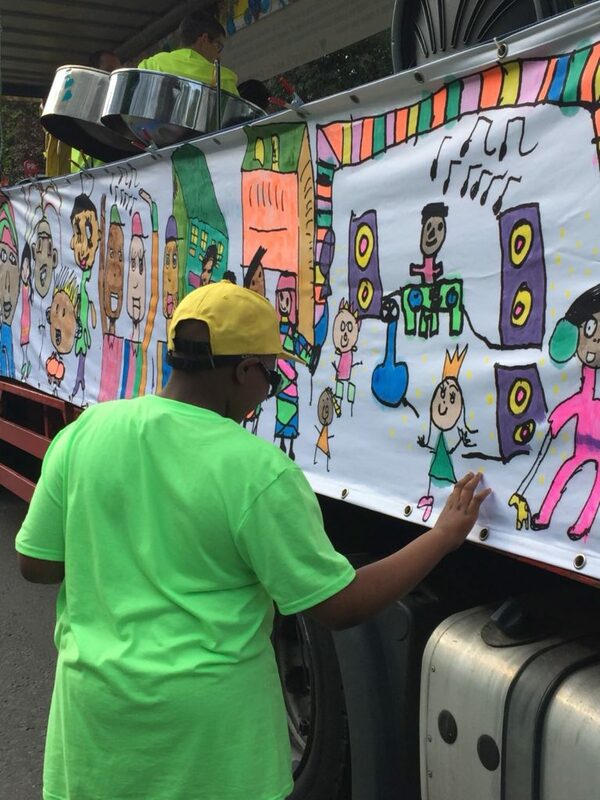 Children who took part were very keen to see the finished banners on the truck at Notting Hill Carnival in August. 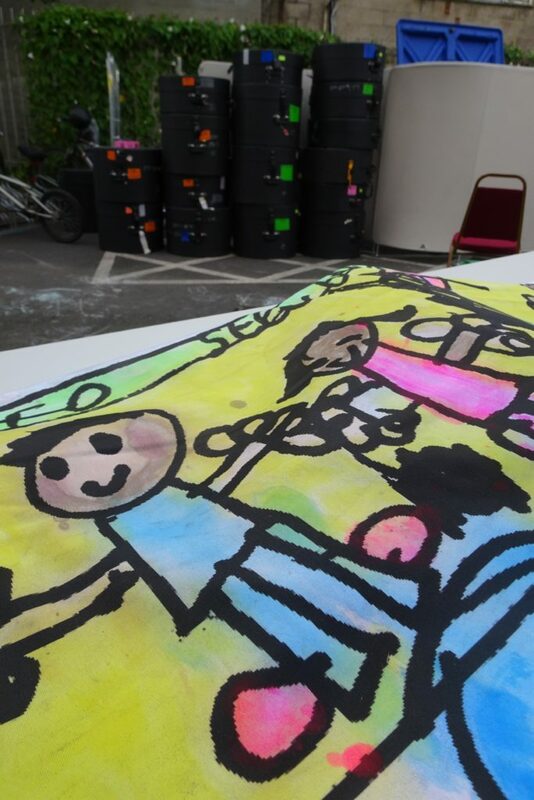 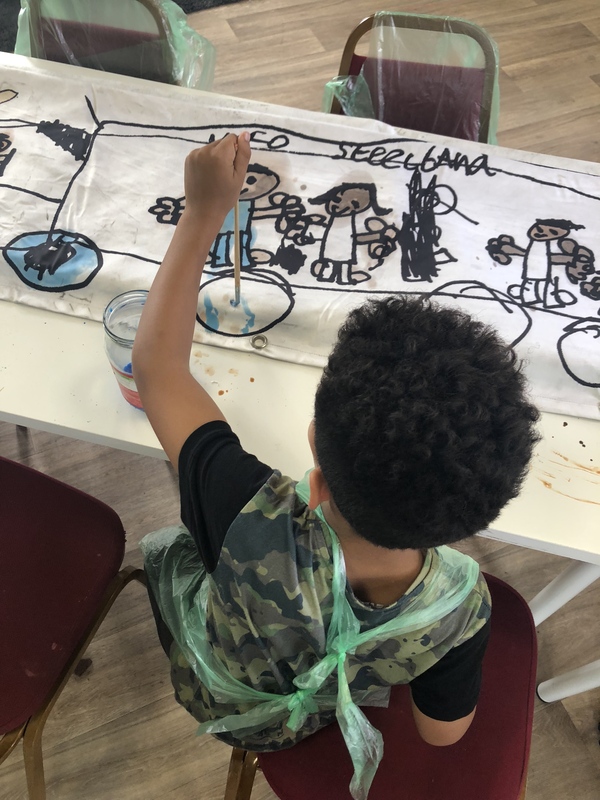 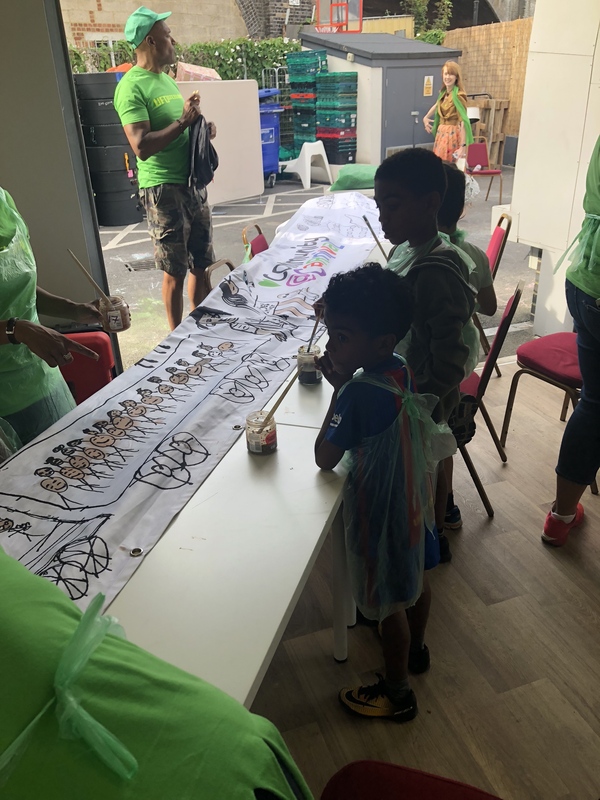 They said they liked the idea that “thousands of other people will get to see our work.” Some of our volunteer pan players admitted they rarely get to the chance to ‘play with paint’, and ‘colouring in’ 100 square meters of wonderful drawings created by children was so much fun. 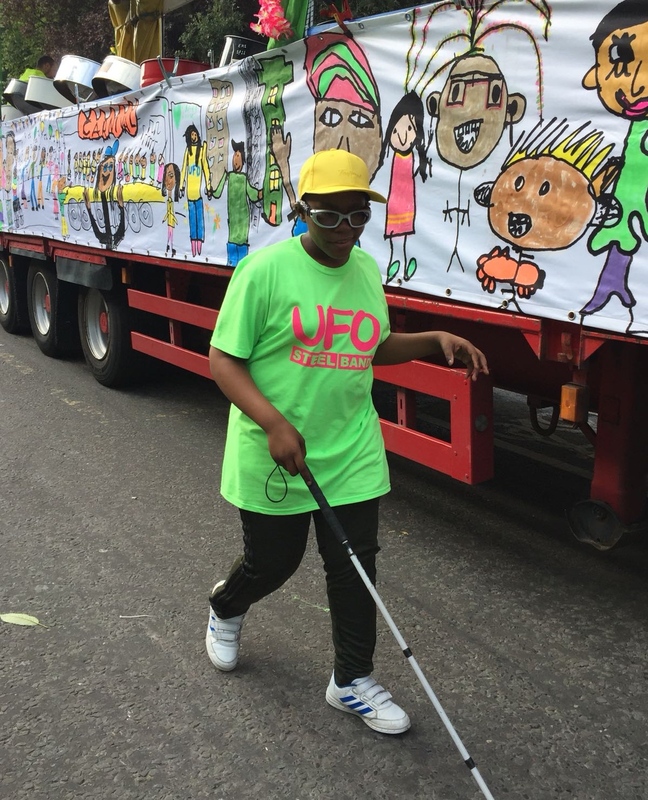 We were very pleased that some of our visually impaired steelpan players got to take an active part in the activity and work with the children. 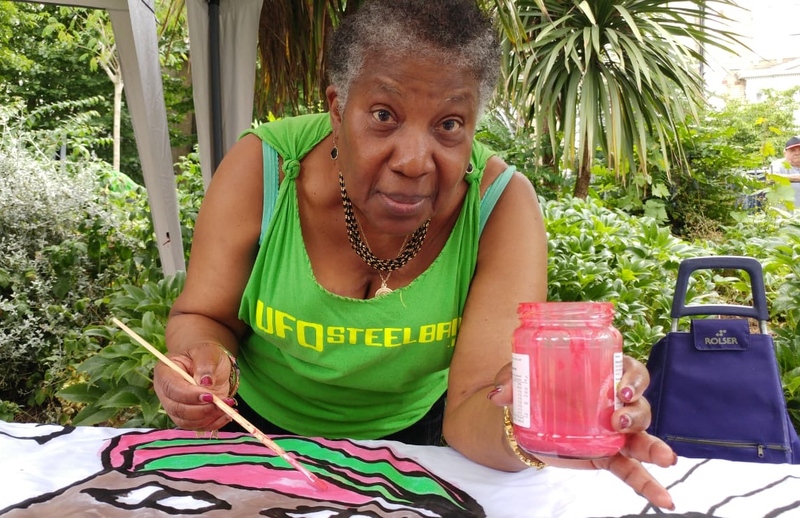 Blondell – who is one of our senior members and is partially blind – asked children to pick colours for her and she managed to use the paint if she got up close… she said it was the first time she had done anything like this since she went blind, and had never thought that she could be included in painting on canvas and have such a wonderful time doing it! 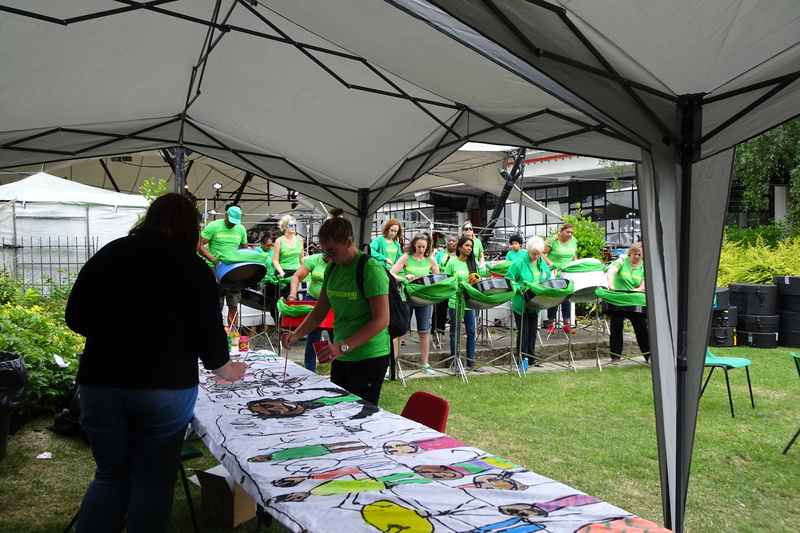 These are the banners being attached to our truck…. 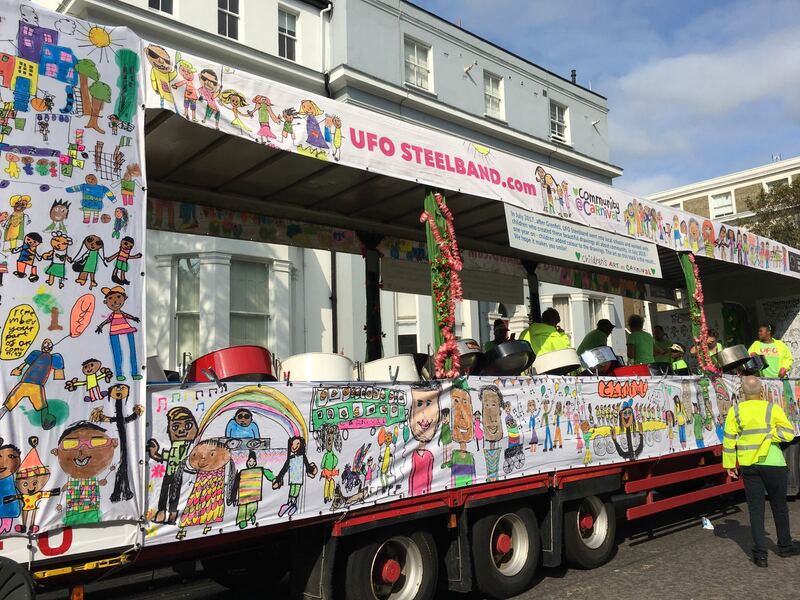 And this is the truck, looking fabulous at Carnival! 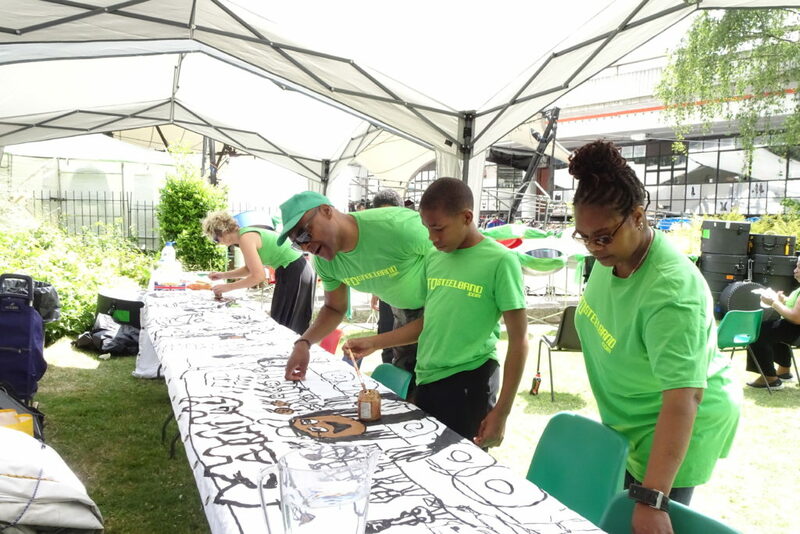 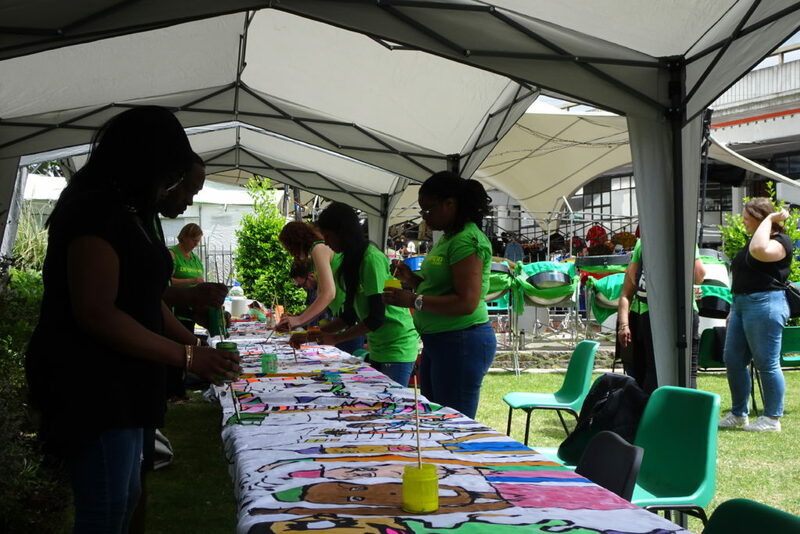 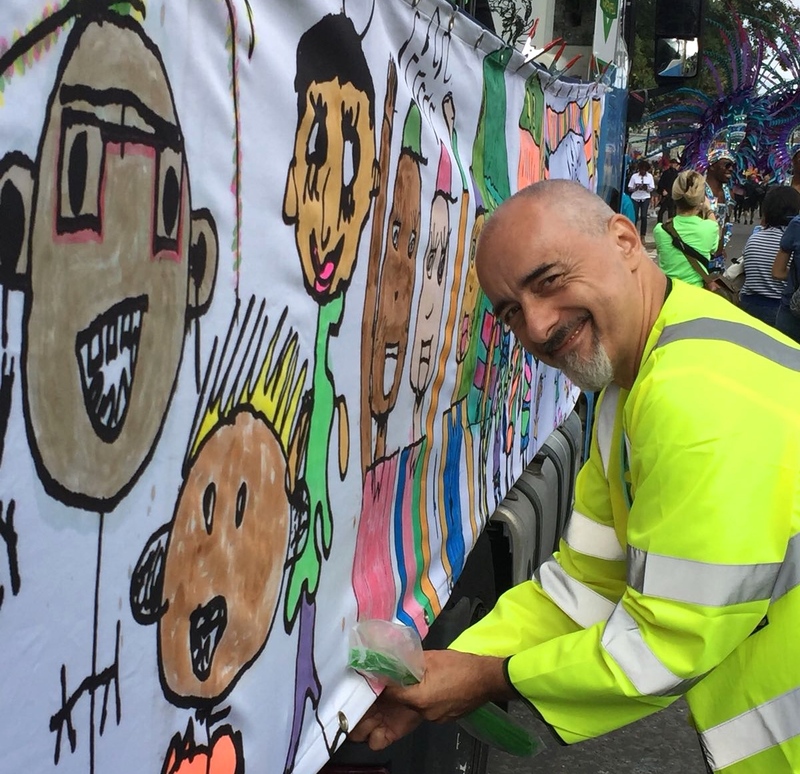 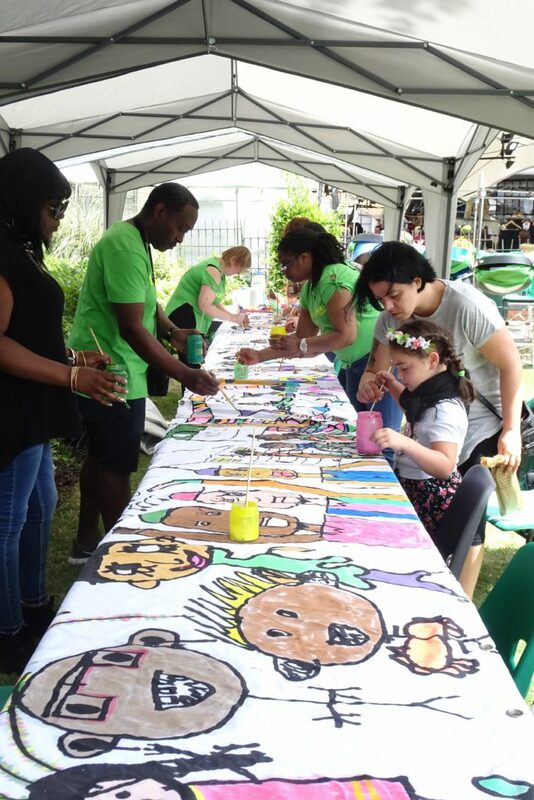 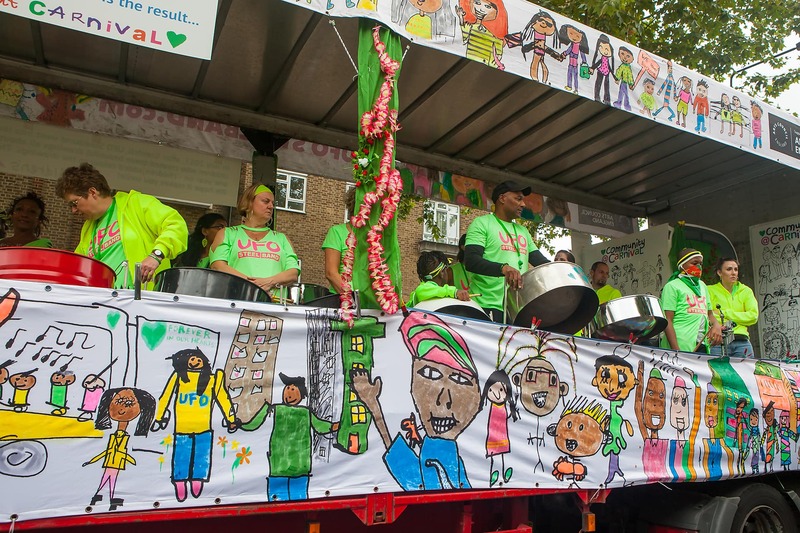 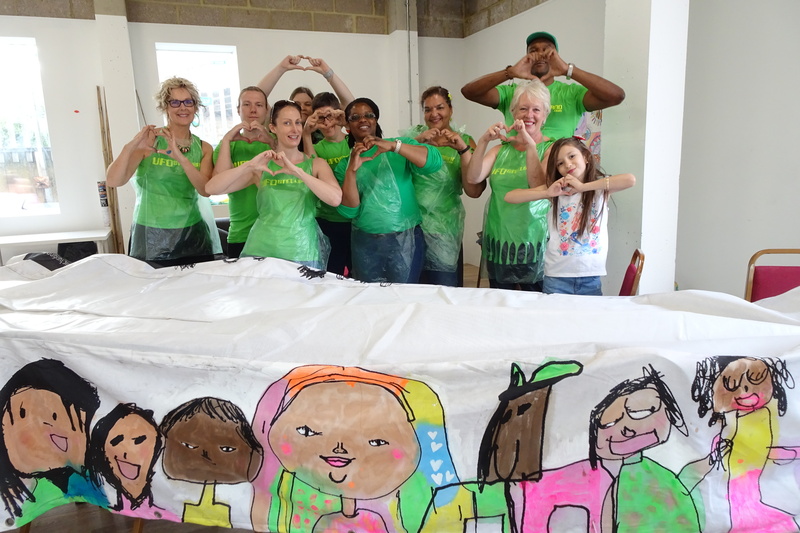 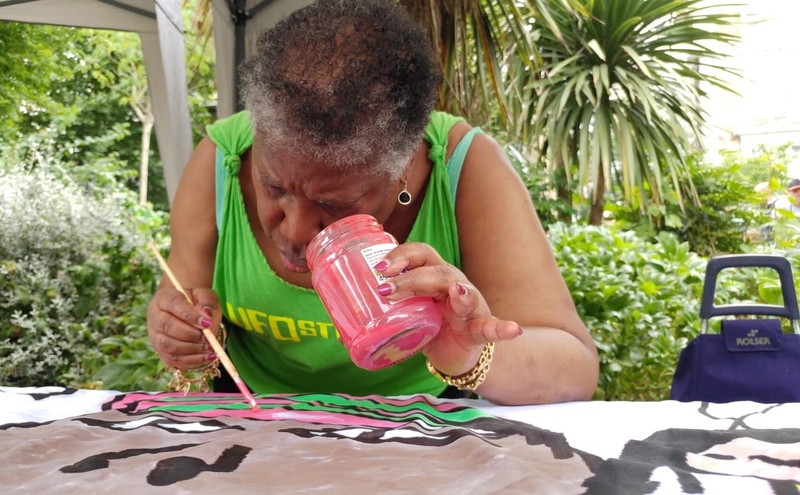 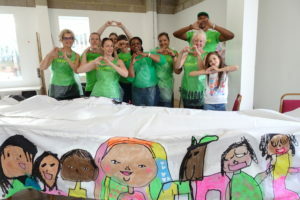 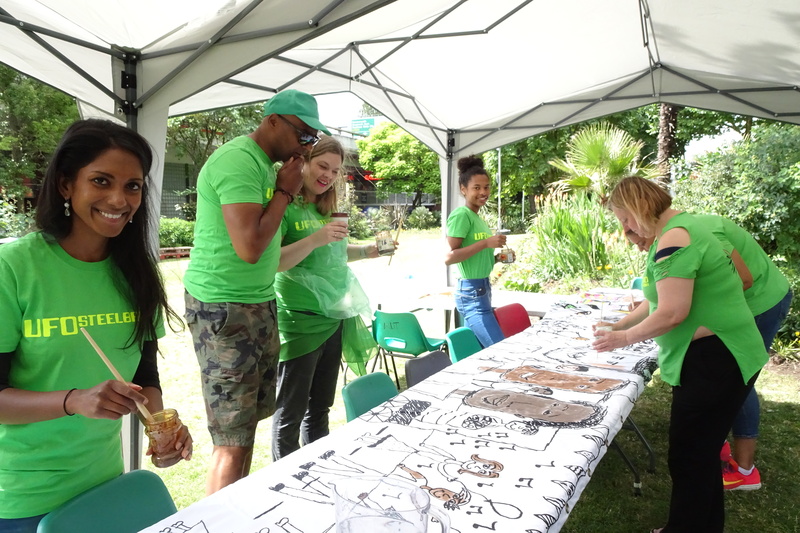 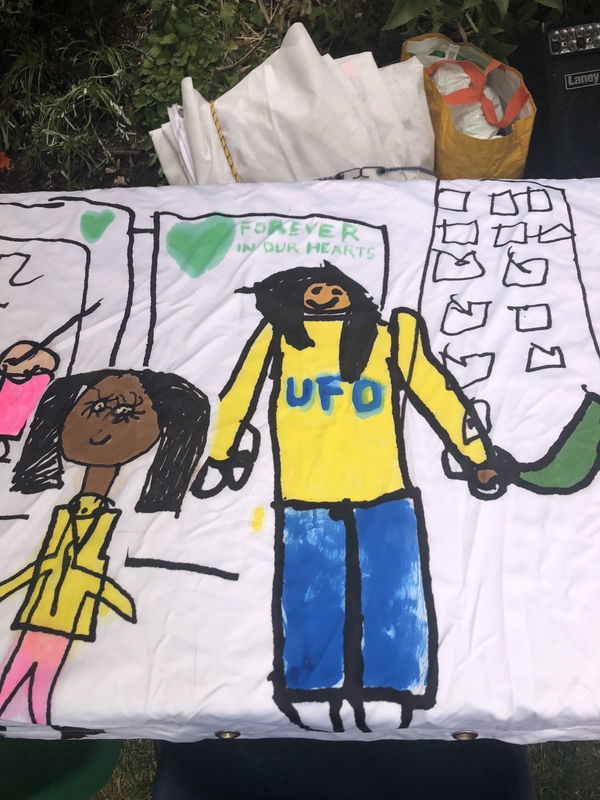 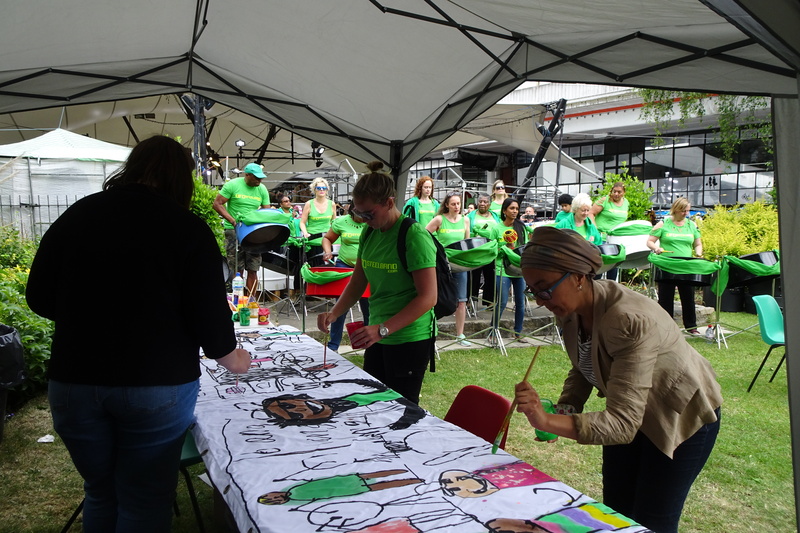 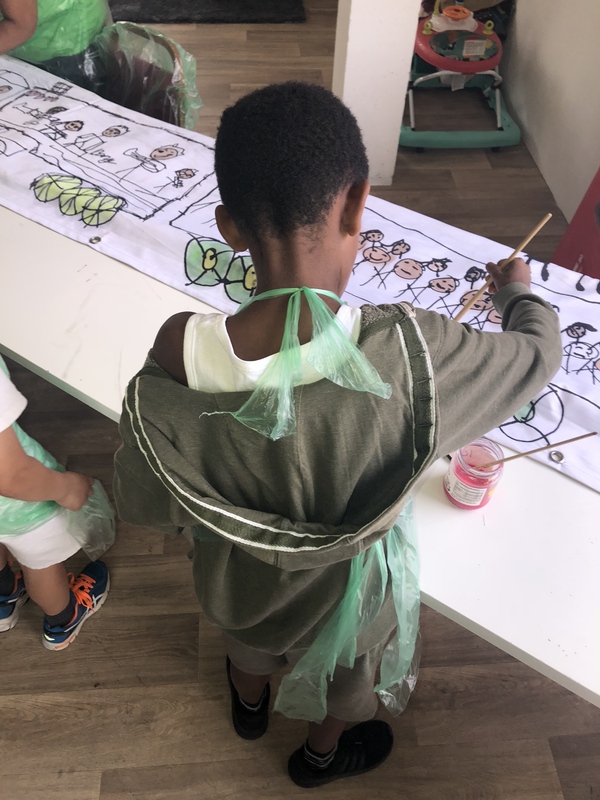 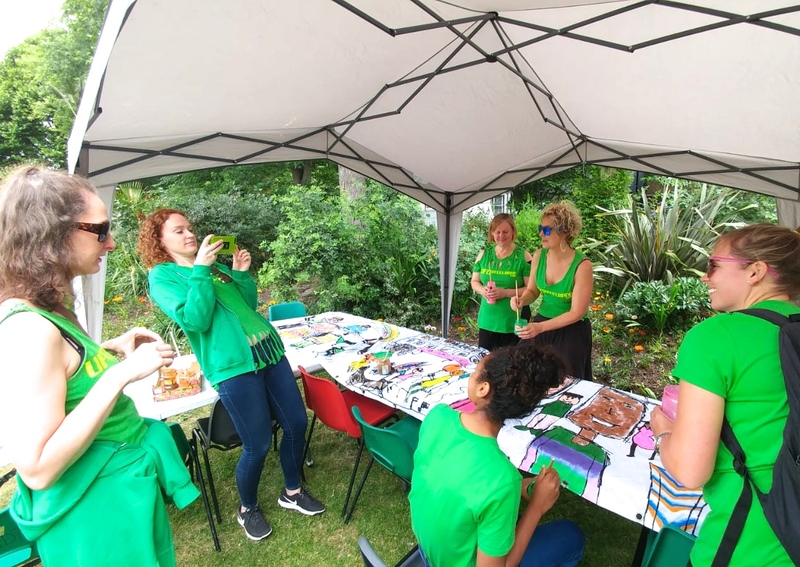 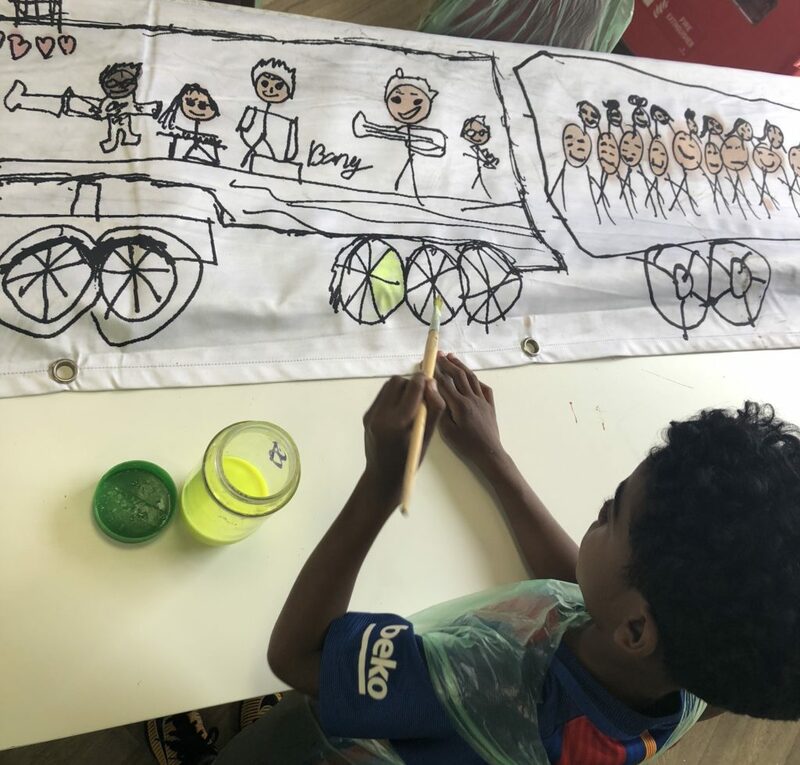 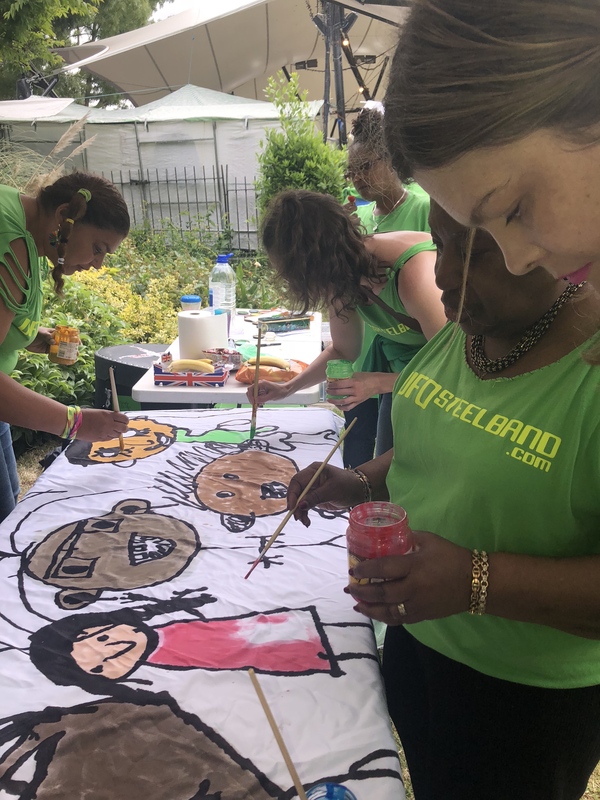 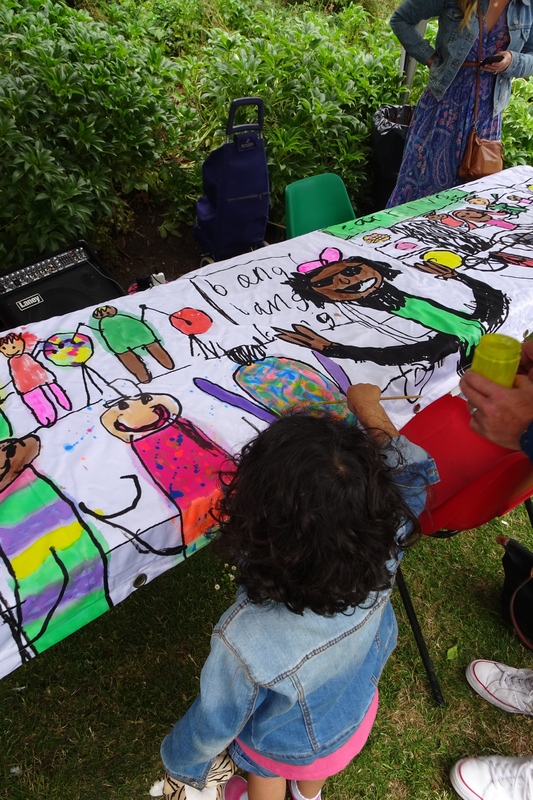 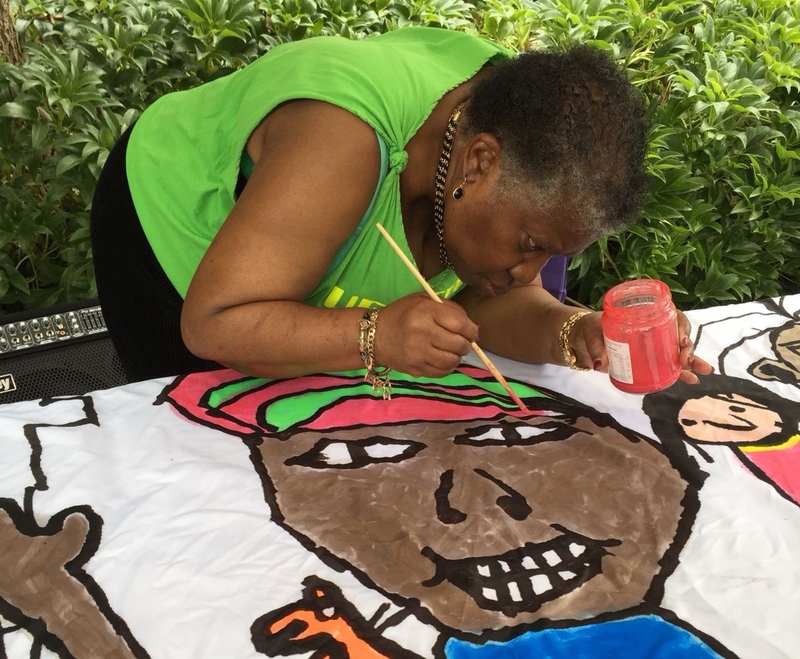 People said that it made them smile, and when they realised that the art had been created by children affected by Grenfell, it made them consider the “lifting and healing power of children’s art.” The banners also adorned the truck at Hackney One Carnival in September 2018, and one audience member said: “That children affected by Grenfell can create such wonderful, hopeful drawings, is inspiring.” Most importantly the artwork also served another purpose – to keep Grenfell in people’s hearts and minds. 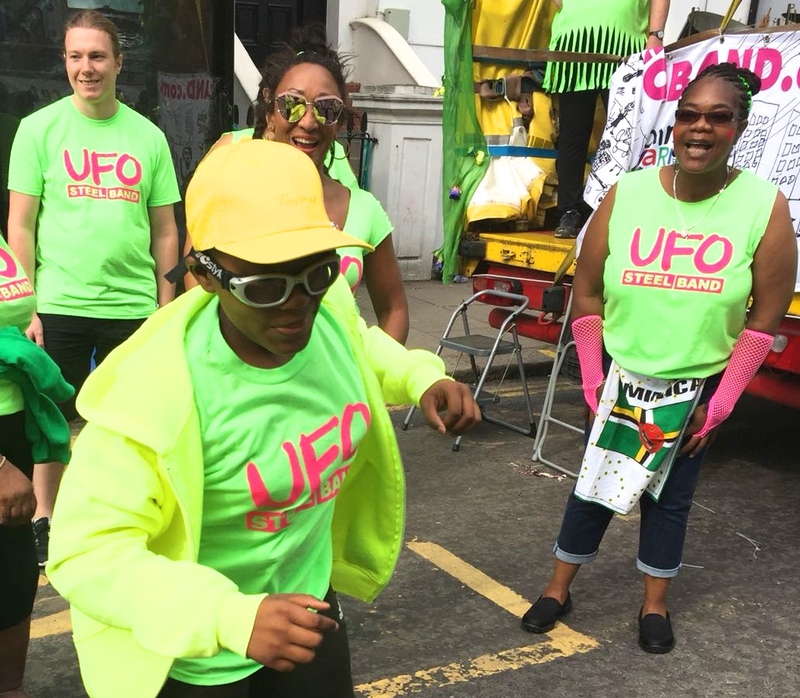 And this is UFO having fun at Carnival!!! 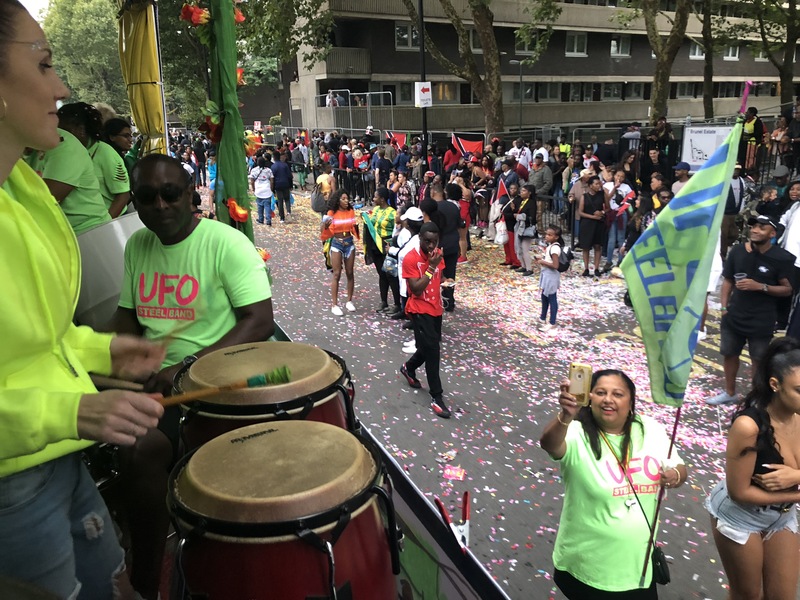 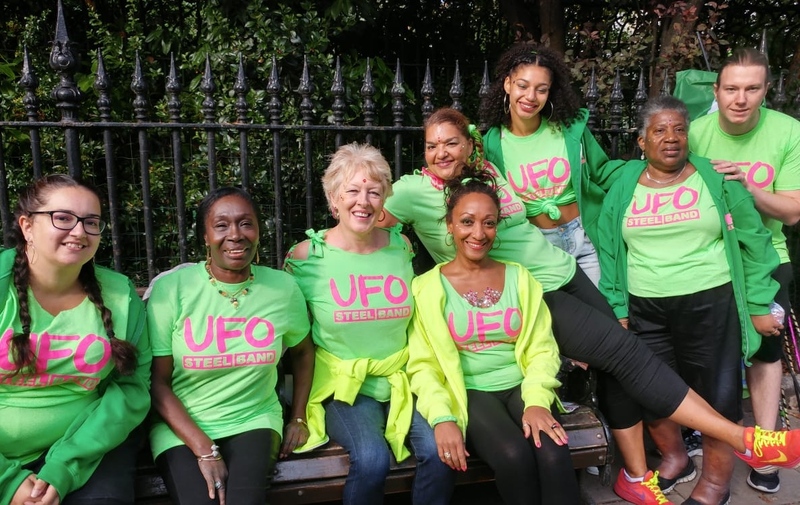 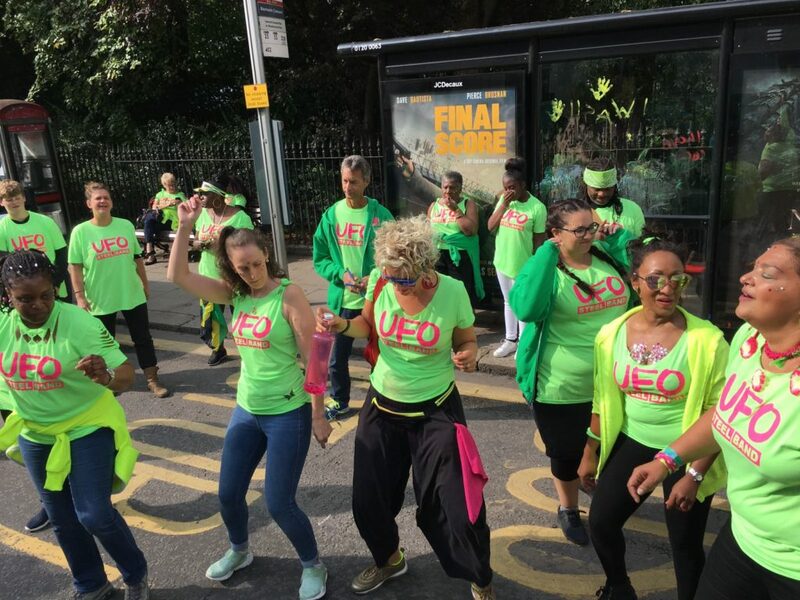 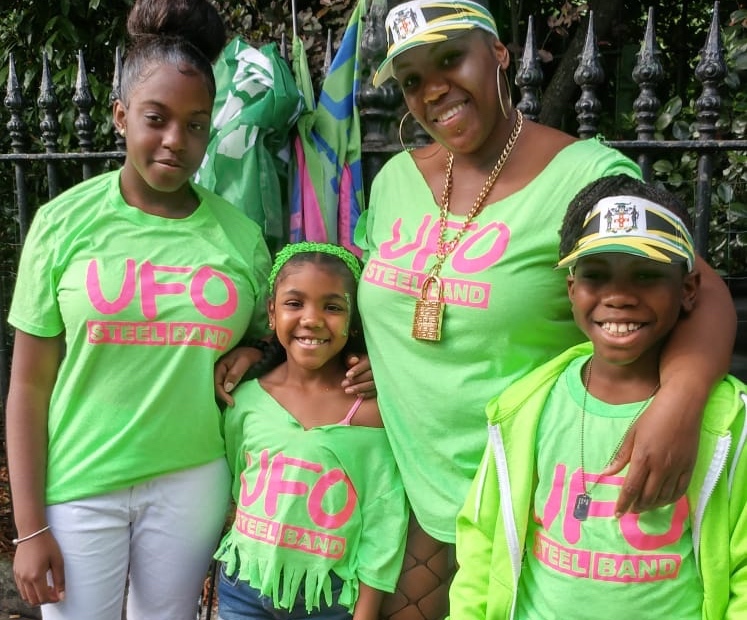 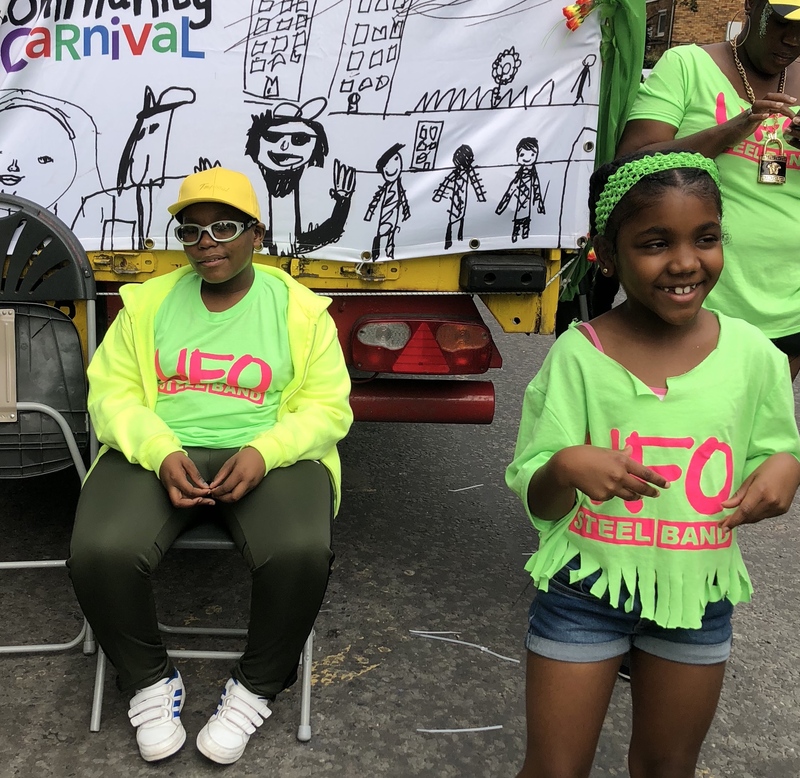 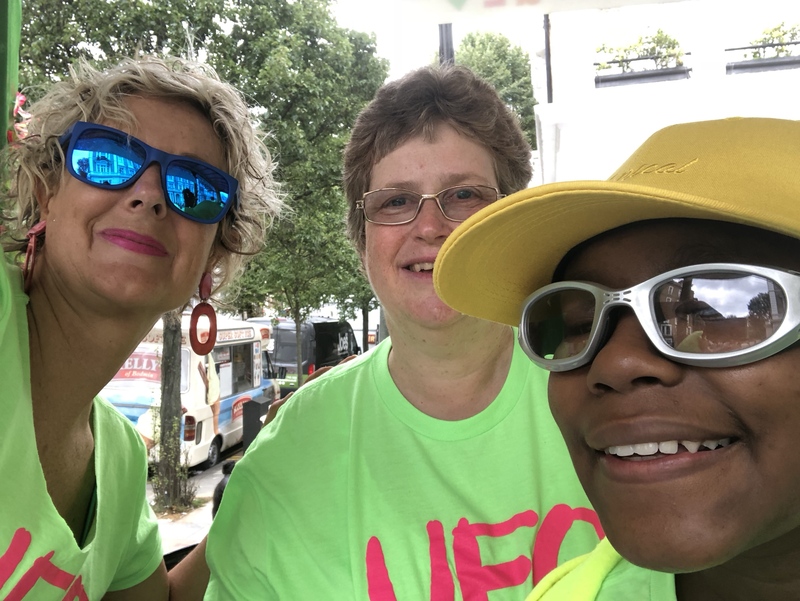 This film made by a player in our guitar section sums up the fantastic time UFO had on the road at Carnival 2018 – we can’t wait for next year!